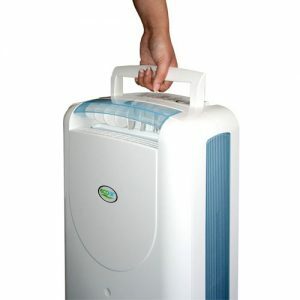 The EcoAir DD122FW Classic MK5 is a lightweight desiccant dehumidifier with a slim and compact design. But how effective is it at removing water from the air? Can it dry out humid rooms quickly or does it leave condensation on windows and walls? Keep reading our DD122FW Classic MK5 review to find out. The DD122FW Classic MK5 has recently been renamed to DD1 Classic Mk5. We’re going to use the old name, however, as it’s more common on shopping sites. 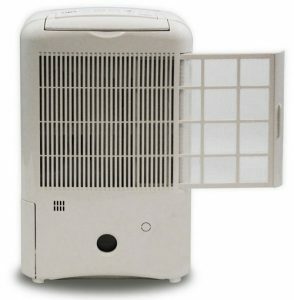 The EcoAir DD122FW MK5 Classic is one of our top recommendations for a desiccant dehumidifier. It has a range of features, including a 3D Louvre and ioniser. Most importantly, it's quick to dry rooms in both cooler and room temperature environments. 5 What’s the Difference Between the DD122FW Classic MK5 and DD122FW Simple? In terms of appearance, it’s a simple dehumidifier that blends unobtrusively into most homes. It’s not the most stylish model on the market, but it’s not ugly either. One of the great things about the DD122FW is how compact it is. 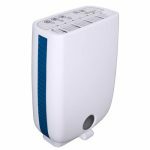 It’s one of the smallest desiccant dehumidifiers on the market, with a width of just 29cm and depth of 17cm. 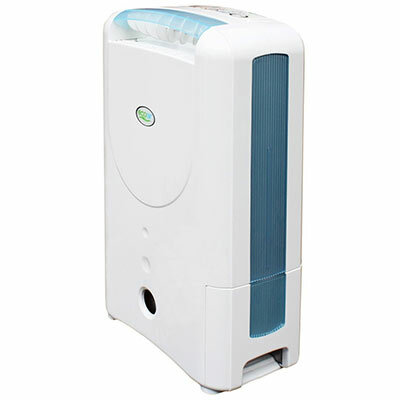 If you’re looking for a small dehumidifier that’s also fast at extracting water, it’s one of the best options. On the inside, the MK5 has a redesigned heating element. Desiccant dehumidifiers use absorbent material to collect water, which is then heated so water drips into the tank. The Mk5’s heating element provides a more even heat to increase the efficiency of the machine. This feature isn’t going to have a noticeable effect unless you’ve used previous versions of the DD1, but can reduce energy bills and also increases the lifespan of the machine. There’s also an ioniser and anti-bacterial filter. Aside from providing cleaning air, the combination of filter and ioniser can reduce allergy symptoms and even help with asthma. One of the drawbacks to the EcoAir DD122FW MK5 Classic is the two litre water tank. This is relatively small and means you’ll need to empty it frequently – especially in humid environments. 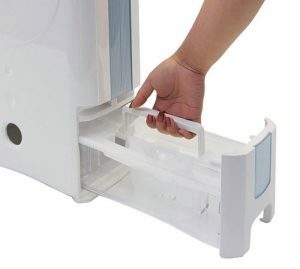 We think the small water tank is forgivable though, as EcoAir has designed it to be a portable and compact dehumidifier. There is also a continuous drainage option. The tank is located on the side of the machine. While we prefer front loading tanks, as they can be accessed regardless of the machine’s position, the DD122FW’s tank is easy to remove and empty. The tank also has a handle. As we mentioned, the MK5 has a slim design so it’s great for small spaces. It’s also very lightweight at just 6kg and has a carry handle, making it highly portable. The only complaint we have is that it doesn’t have castor wheels. This isn’t a major problem considering the lightweight design, but wheels can be convenient for moving a dehumidifier quickly around a room. The maximum water extraction capacity of the DD122FW is 7 litres per day. This might seem small compared to refrigerant models, but is around average for desiccant models. Keep in mind that desiccant technology is much more effective in cooler conditions than refrigerant. So even though the maximum capacity is lower, desiccant models often remove water faster than refrigerant when tested at the same temperatures. In fact, the DD122FW excels at drying out both cool and room temperature rooms. Water is extracted quickly, helping to save energy and quickly eliminate condensation or damp. To increase energy efficiency further, the DD122FW comes with EcoAir’s Eco E7 technology. In simple terms, this monitors the humidity levels and ambient temperatures, before adjusting the dehumidifier’s mode depending on what’s needed. Unlike basic humidistats, the E7 technology can switch between standby, economy and full power, rather than just on or off. EcoAir claims this can reduce energy bills by up to 40%, which is a significant saving. There is also an “Overdry Protection” feature that stops dehumidifying if the humidity gets too low. As it’s great for dehumidifying in cooler temperatures, the DD122FW is a good option for garages and conservatories. With an extraction capacity of 7 litres per day, this isn’t a dehumidifier for a large home or extreme damp. It’s powerful enough for flats and small houses though. The DD122FW MK5 is one of the quietest dehumidifiers we’ve seen. 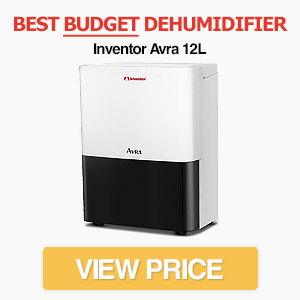 With a noise level of just 34dB, largely due to the desiccant technology that doesn’t require a compressor, it’s a great choice if you want to be in the same room as the dehumidifier. Desiccant dehumidifiers tend to be less energy efficient than refrigerant models, and the DD122FW is no exception. On full power it consumes 580W, although this drops to 300W when using lower settings. It’s reasonably efficient considering its extraction capacity though, and the automatic mode helps to reduce energy usage further. The fact that it can quickly dry out rooms also means you won’t need to leave it running for as long. One of the most interesting features is the 3D Louvre. This can channel air over a wide area or focus on a specific spot. You can, for example, use the spot mode to target damp or mouldy areas of the wall. While you’ll probably use the wide area mode most of the time, it’s a useful option to have. It’s not as advanced as the louvre of the EcoAir DD128 though, as this model also comes with a swing function. Desiccant technology. This means there’s no need for potentially harmful gases. Laundry mode. A laundry mode is included to help dry clothes quickly and without releasing too much moisture into the environment. Tilt protection. 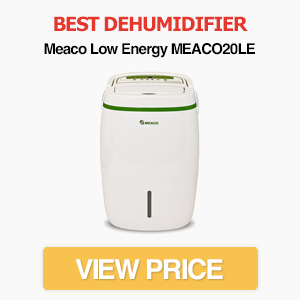 This is important for lightweight dehumidifiers, as they can be easy to knock over. Automatic restart. If power is lost, the dehumidifier will automatically restart when it returns. Timer. There are two, four and eight hour timers so you can set the dehumidifier to run without worrying about wasting energy. The EcoAir DD122FW Classic MK5 comes with a two year manufacturer’s warranty. As you can see from the image above, the DD122FW has a relatively simple electronic control panel. There isn’t an LED display for humidity, which is a shame, but it’s straightforward and intuitive to use. The machine has buttons for switching on and off the ioniser, setting a timer, adjusting the louvre and activating laundry mode. There are also options for Economy and Full power mode, along with a button to activate the automatic mode. The EcoAir DD122FW MK5 Classic has an RRP of £190, which puts it on the borderline between our Mid-Range and Premium categories. Even so, we think it provides excellent value for money. It’s fast at removing water and comes with a range of useful features – some of which aren’t found on more expensive models (such as the adjustable louvre and ioniser). What’s the Difference Between the DD122FW Classic MK5 and DD122FW Simple? There are several important differences between the two models. While both are similar in size, extraction capacity and weight, the DD1 Simple has a basic rotary dial control panel. It doesn’t include the energy saving automatic mode of the Classic MK5. The Simple also doesn’t have an ionisier to provide cleaner air or a 3D Louvre. The right option depends on your situation. While we think the Classic Mk5 has enough features to justify the extra cost, if you’re on a tight budget the Simple is still effective at drying rooms. 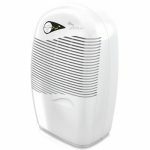 The EcoAir DD122FW Classic MK5 is an outstanding desiccant dehumidifier that easily made our list of the best models. It excels at its main function – removing water from the air – and is efficient in a range of temperatures. The only real drawbacks are the small water tank and lack of castor wheels, but these are minor complaints considering the compact size and lightweight design. In short, it’s highly recommended for small homes, flats, garages, boats and caravans.